So amazingly delicious!! This slow cooker potato soup is made of red potatoes with a lemon rosemary infused milk base. 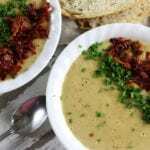 Crispy prosciutto and chives takes a great soup and makes it even more special. Easy to make and ultra creamy! So perfect as a comfort meal but also special enough for Holiday celebrations. Cut potatoes into smaller chunks, dice onions and prepare garlic. Heat a large frying pan over med/high heat. Add 1 tbsp of butter and 1 tbsp of oil. Once butter is melted add onions and sauté until lightly caramelized, about 10 mins. Add garlic within the last minute of sautéing. Transfer to crockpot. Place frying pan back over med/high heat. Add another tbsp of oil and butter. Place 2-3 cut potatoes single layer in frying and let crisp 10-12 mins, stirring a few times to crisp other sides. Transfer to crockpot. Crisping the potatoes is an optional step but adds an additional layer of flavor. Cover potatoes and onions with broth. Cook on high on 3-4 hours or low 7-8 hours. Using a vegetable peeler, zest lemons making sure to remove just the zest but leave the white pith behind. Within the last half hour of crockpot cooking place milk, rosemary and lemon zest in a medium sized sauce pan over medium heat for approximately 20 mins. This should be enough time for the milk to heat through throughly and to be infused with the lemon and rosemary flavors. Do not boil. If milk looks like it will boil lower heat to low. Once cooked, process potatoes in broth using and immersion blender or potato masher until smooth. Blend in about 1/2 cup of potato mixture into sour cream and then add to crockpot. Strain milk of rosemary and lemon zest and add to crockpot. Stir well. Let soup sit on high until prosciutto is crisped. Place a large sized frying pan over medium heat. Add oil and prosciutto. Sauté stirring often until crisp, about 10 mins. Transfer onto paper towel lined plate. Dice chives. Serve individual bowls of soup and garnish with crisped prosciutto and chives.